Here is the ultimate in teaching Anger management using the Cool Anger Theory. This program is excellant for anyone wishing to teach anger management. The program includes two DVDs that can be used to teach the program alone. The instructor just has to have the forms filled out show the video, pause for class discussion and print a certificate. I developed this program working with Probation and Parole Addiction populations. The program is easy to understand and apply to real life. Price $75.00 Just click the add to cart button to order. 1. One Bound Manual with all forms. 2. 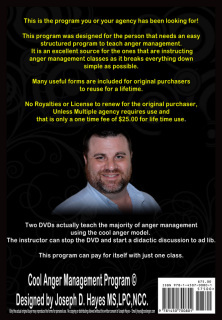 Two DVDs of Joseph Hayes teaching/presenting Anger Management Class. All products will be mailed. Click on the picture to see Mr. Hayes online Anger Management website 'coolanger"
For a better price you can pick the economic download program for $35.95. See Teach Anger Management Tab or go to http://www.teachangermangement.com Same program you just down load and print manual and burn DVDs on your own computer. The complete Instructional Manual on Teaching Anger Management Classes using the Cool Anger (TM) Program with Forms and DVDS. Great Product as all I received was very positive feedback from buyers. 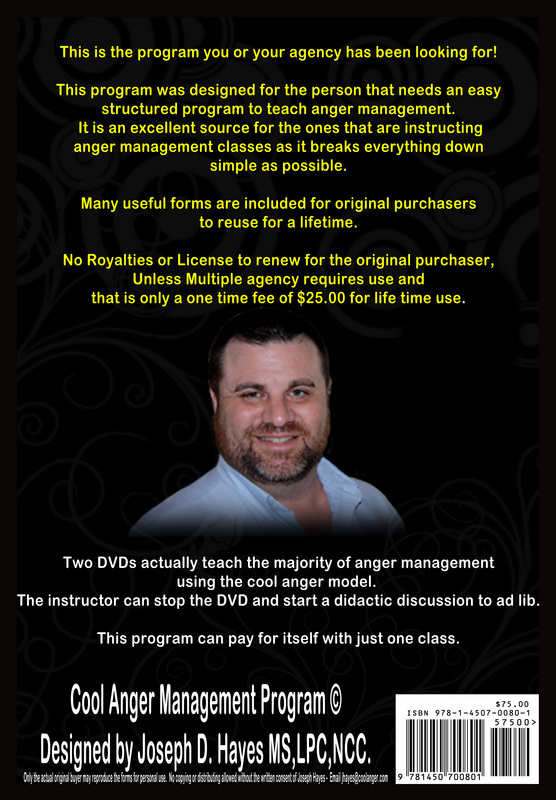 A Complete manual on how to teach Anger Management using the Cool Anger Theory with DVDS that can actually teach the class for you just by pausing and allowing group processing. The forms are helpful in setting up the class and recording information. I have shared alot of my experiences as an anger management instructor for an overall good grasp of the subject and qualities needed in an instructor.